I spent this morning in a John Lewis store on Oxford Street, at the launch of its new Smart Home demonstration area. What interested me was not so much the tech, nice as it was, but the fact that the company thinks now is the time to really push this market. Smart home technologies are not new. I’ve written about them before many times on this blog, often bemoaning the lack of integration and failures of the various systems to present a truly consumer-grade experience. So what has changed? Why is a company renowned for customer service willing to take a punt on pushing these technologies? I think the answer is that there is now a confluence of forces, combining to make the time right for a real drive to make the smart home a mainstream proposition. The first factor is a level of vendor focus that is hard to ignore. With smartphone revenues on the wane for many, and tablets and fitness trackers not proving the revenue stream some hoped, there is a huge hunger for a new category that can restore some good cheer. Smart home technologies around security, comfort, time-saving and entertainment have potentially very broad appeal. Hence huge marketing and R&D efforts from the likes of Samsung. The second factor is perhaps connected: fast-growing consumer demand. According to John Lewis, web searches for smart home related keywords are up 18 times over last year. 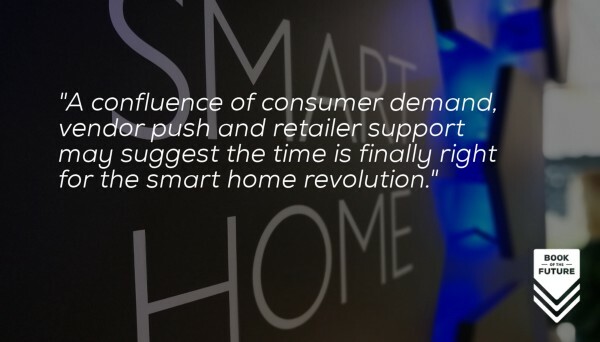 Sales of smart home products in the store have climbed 81%. This perhaps feeds into some highly positive analyst forecasts, suggesting upwards of 450% growth in the next few years. The third factor is perhaps the products themselves, though this remains up for question. In amongst the fractured, fragmented market and the proliferation of ‘standards’, there are some products that just work. Philips ‘Hue’ lights for example, one of the products that we set up with absolutely no trouble at all for the show I did with Phil Spencer on smart homes for Channel 4. And the well-proven Sonos audio system. Nest’s smart thermostat has the occasional kink but is generally consumer-grade. 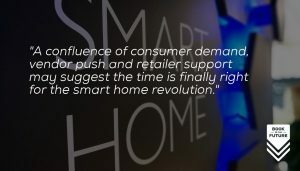 Building a proposition around hero products like these that can add some value, whether that’s in financial returns, ease of use, or outright luxury, John Lewis may make their bet on the smart home pay off. And they may have timed it just right. Now we just need to solve the problems of fragmentation…and security.